City Social is owned by luxury caterers Restaurant Associates (who also boast Roux at Parliament Square in their stable), with Paul Walsh acting as head chef under the guidance of Jason Atherton. Walsh previously worked under Gordon Ramsay for five years, eventually ending up as senior sous chef at Royal Hospital Road. The restaurant opened in May 2014 amid much PR buzz and quickly won a Michelin star in the September edition of the guide. 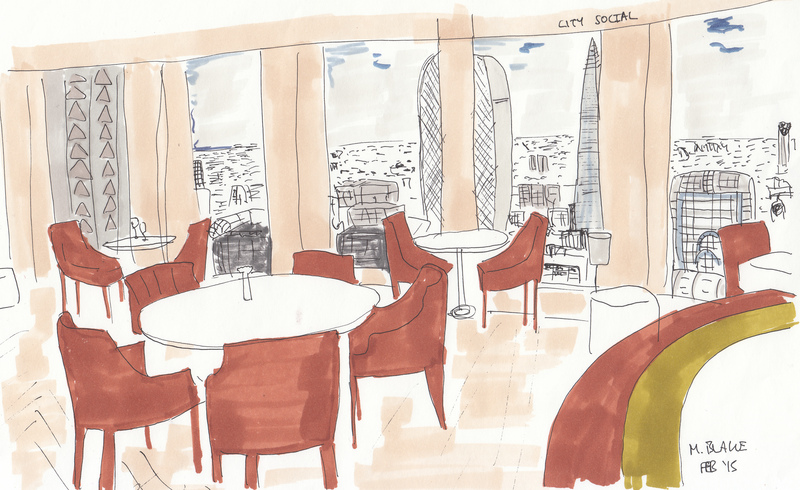 It is housed on the top floor of Tower 42 and boasts panoramic views of the London skyline (although you are not quite as high up as those dining in Sushi Samba and Duck & Waffle in the Heron Tower). The dining room has been decked out in lots of dark wood tones and boasts a large bar with a number of leather booths which all face outwards and have great views. We went along for lunch – they don’t have a set lunch menu, instead they offer an a la carte menu with starters at £9-15 and mains at £18 to 38. I started with a ham hock and pig’s trotter in crispy breadcrumbs, with black pudding, apple and Madeira (£13). The hock and trotter had been shredded and were wonderfully rich and gelatinous with just the right level of seasoning so they didn’t taste salty. The black pudding added further depth to the dish – it was smoky and peppery, and the lattice brought crunch without being greasy. 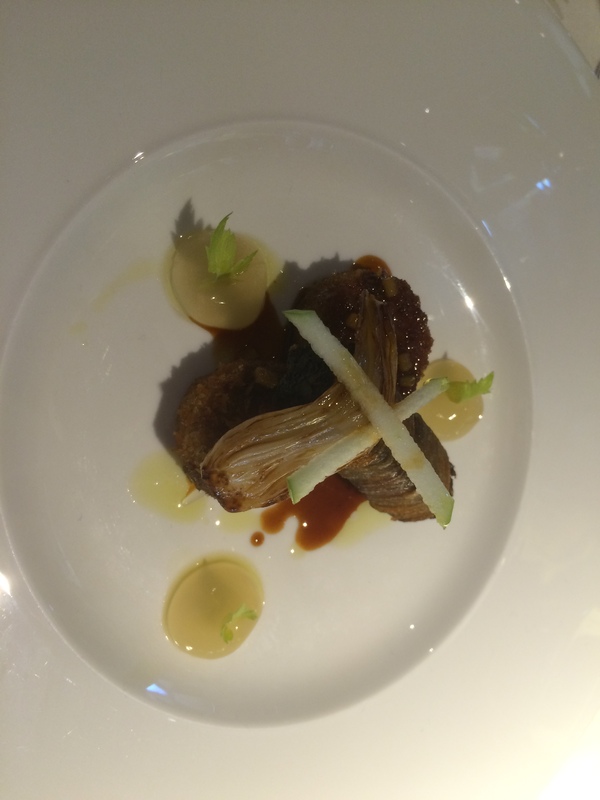 With all of this richness the dish needed some acidity which was introduced by raw apple and a light apple jelly. This was all rounded off with a perfectly executed Madeira sauce – a safe but well balanced dish. 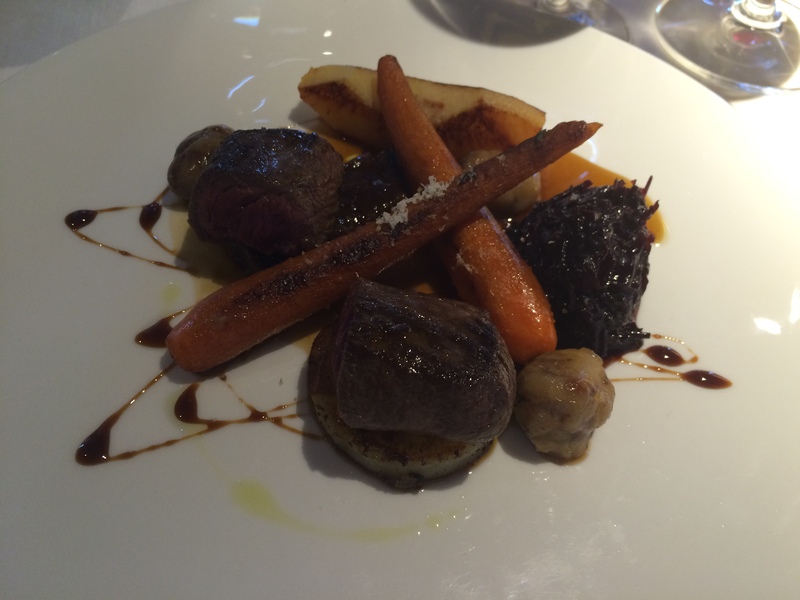 For main course I had venison loin with red cabbage, smoked chestnuts and carrots (for a whopping £34). The venison had been properly rested so the meat was soft and succulent, it combined well with the punchy, smoky chestnuts and slightly sweet carrots. The portion size was generous and the cooking immaculate, but at £34 this was a very expensive dish. And I totally agree with Mr Rayner – the service was stiff and unfriendly yet also sloppy. The sommelier knocked the bottom of a wine bottle off of one of the glasses on our table and he was remiss in his topping up duties, extra bread was offered and didn’t appear…….I expect far better from a Michelin starred restaurant.